With the Dow Jones Industrial Average plunging below 7,000, to its lowest level in more than 10 years, it’s hard for me to focus on this month’s editorial. I’ve always had a love/hate relationship with the stock market – yes, even before the downward spiral of the past several months. I’ve got a 401(k) (now a 201(k), as the joke goes), a mutual fund and even some individual holdings. When times were good, I celebrated the returns on those investments. But even in those good times, I never fully bought into the idea that the stock market was truly reflective of the country’s economy. It was legalized gambling, I used to say. You gotta get dealt the right cards. The reports of the past few months only reinforce that belief for me. Maybe I just don’t get that big picture, the TARPs, the MBSes, the ETFs, the necessity of an AIG. Instead, what I see is H.J. Heinz Co. surprising Wall Street with a 12 percent rise in third-quarter earnings per share and an 11 percent rise in net income to $242 million. Kellogg Co. ending the year with profits up 4 percent. Sales at J.M. Smucker Co. in the third quarter (ending Dec. 31) were up a staggering 78 percent -- the big Folders acquisition explains that rise, but net income was up a more staggering 84 percent. Another company buoyed by – not weighed down by – a big acquisition was Ralcorp Holdings Inc. (which acquired Post cereals), where earnings were up 55 percent in its first quarter (ending Dec. 31). Did you see this headline? “Dean Foods Posts Highest Adjusted Quarterly Operating Income in Its History [$67.4 million]. Grupo Bimbo, the Mexican bakery with substantial U.S. holdings: full-year sales and income up 12 percent. And there were many respectable near-misses. Coca-Cola profit slipped 3 percent in 2008. Fresh DelMonte Produce earned $158 million for 2008, within a hairbreadth of 2007’s $180 million. Second-quarter (ending Dec. 31) earnings at Clorox Co. (they still make a lot of sauces and dressings) also were within arm’s reach of the previous year, earning $86 million 3 percent sales growth. Cautious optimism and careful planning fill our report from the annual meeting of the Consumer Analysts Group of New York. Unfortunately our news pages also carry a story of plant closings. There’s still a lot of pain, especially in the animal protein business. But the daily numbers from the stock market usually get overwhelmed by the bailouts of banks, insurance companies and car companies. They’re important parts of our economy, I’m sure, but they don’t tell the whole story, just the overwhelming story. Put the dark news of Wall Street aside for a moment. We have three important features coming up that need your help. Voting just began on our web site for three R&D Teams of the Year. I’ve mentioned the nominating process in the past, and many of you participated in that Round One. Now it’s time for the finals. We’ve narrowed your nominations to a small handful of teams in each of the three company sizes. Please go back to the home page of our web site or go directly to www.FoodProcessing.com/nominate and cast your vote for the most innovative product development teams. Second, you product development people also should be seeing an invitation to our annual R&D Survey. Tell us all about your product development priorities for the year and the newfound pressures this economy is putting on you. That will be May’s cover story. That should be followed by an e-mail invitation to all our subscribers for our third annual Salary Survey. 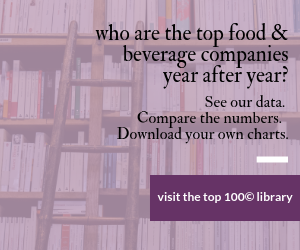 Last year nearly 2,000 of you answered our call for a fascinating look at pay and job satisfaction across the food industry. That will be June’s cover story.